The following is a thorough Qmee review that discusses everything you need to know about this website starting with the way it works and up to the rewards you can earn and its issues. By the end of our Qmee review, you’ll have a better understanding of the website which should, in turn, help you decide if it’s something you’re interested in using. Though Qmee is mostly a praised and well-regarded site, its users still expressed some concerns. These mostly revolve around issues with taking surveys and using the web search function. The following Qmee review will go over these matters as well. Qmee is a free software extension that you can download on both Mac and PC systems. In addition, you can also download its app on both Android and Apple devices. This rewards website, similar to sites like Inbox Dollars, pays you for performing specific tasks. It’s a simple way of earning small (or in some cases even more substantial) amounts of money. Is Qmee Legit or a Scam? The consensus is that Qmee is definitely not a scam. It is a free-to-join and download website. There is no fraud involved as you are not risking anything, especially money-wise, by creating an account and using their services. Although Qmee does collect a good deal of user information, the platform is transparent about this aspect. No users appear to mention the information gathering as you check out a Qmee review, so it’s reasonable to assume that this doesn’t affect them. Before you can begin using this service, you must first provide some general contact information. After checking these off, you will receive a link and can install the Qmee extension that fits your browser. From there, it will work in the background alongside your usual searching and shopping extensions. For the moment, Qmee works for just Unites States and United Kingdom residents but is reportedly in the midst of extending to other countries as well. Website Searching: Through it, you can earn money by simply using popular search engines such as Bing, Google, and Amazon. However, this only happens as long as you click on the relevant sponsored links. Third-Party Surveys: Qmee also comes with the chance to earn money by completing third-party surveys. These can be brief (1 minute) or longer (20 minutes). However, you must meet a specific set of requirements before taking a survey. Refer a Friend: When you join Qmee, you receive a referral link that can be sent to friends. If someone signs up by following this link, you might get a monetary reward. You can cash out your earnings in three different ways when using Qmee., methods which will be further explained in the sections below. Charity Donation: If you so desire, you can donate some (or all) of your earnings to charity. Qmee offers a list of charities that accept such donations. If you do not see a charity you want to donate to on the list, you can get in touch with Qmee and see if they’ll reach out to the charity and ask them to join. Gift Cards: You can take your cash earnings and turn them into gift cards. The gift cards target services the likes of Amazon, Starbucks, and iTunes, among others. You must have a minimum of $5 or £5 before requesting a gift card. 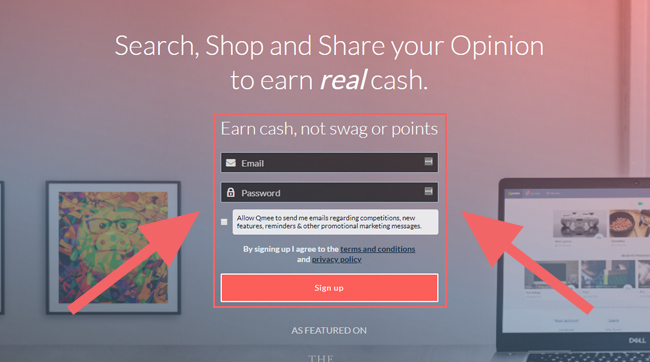 Cash: As Qmee doesn’t deal with points, the primary reward you earn is cash. For those that are not interested in gift cards or donations, you can simply request a cash payout. All you need for this is a PayPal account. Fast Payout: Since Qmee only deals with cash earnings, you can request a payout to your PayPal account at any time. There’s no need to worry about raising a certain amount of points that you’ll then have to turn into cash ( but only after earning enough). No Minimum Withdraw Amount: Though you will have to meet a specific amount before you can request a gift card, there is no minimum amount for withdrawing cash. You can request and send whatever amount of money might be in the bank to your PayPal account. Time it Takes to Earn: Though you can cash out whenever you wish to, it can take quite some time to actually see any earnings. Much of this has to do with the difficulties of meeting the requirements needed for taking surveys and finding Qmee ads in search engines. We found very few complaints about the site while browsing through user opinions as we were writing this Qmee review. There were, however, a couple of issues that commonly popped up and which will be presented in the following. Some users speak of problems with the website search function. They say that you can spend hours or even a week browsing the internet without seeing any ads from Qmee. Other issues focused on the surveys and the users’ being disqualified too often. Several reviews mentioned technical problems, namely, they complained about not receiving notifications. There are several ways to approach these issues. For example, you can deal with the search function issue by simply carrying on with your usual browsing. Too many clicks on random things and Qmee might feel you’re trying to trick its system and start limiting the ads it displays. As for the survey issue, the requirements depend purely on the individual questionnaire. If you aren’t qualified, it’s best to search for surveys related to things you’re interested in. Lastly, technical issues are best handled by contacting Qmee. A list of the various ways in which you can do this will be presented in the next section. Official Website: You can go to the Qmee Contact page for help with technical problems. Social Media: In addition, you can also get in touch with them via the following social media pages: Instagram and Twitter. You will also find Qmee on Google Play. Qmee is also available for download on the AppStore. Qmee is a rewards program that offers you cash for simply searching for items online, taking surveys, or for shopping online. It’s one of the rare rewards websites that only offer cash payouts rather than points, which many see as being a big advantage. As we conclude our Qmee review, we ask those of you who have or are using it to let us know how it’s working out for them. Also, feel free to share any tips or feedback you might have about it.